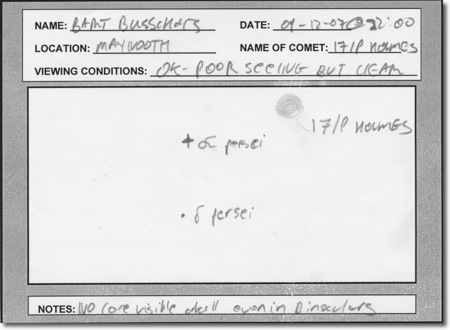 Amazingly comet 17/P Holmes is still visible to the naked eye under good conditions. When it flared up way back in October no one dared predict it would remain visible for more than a week or two. The comet has changed a lot in appearance over the last month and a half though. It started out looking like a star and is not a massive and very diffuse blob which appears as big as, if not bigger than, the Moon. This new defuse character means that the comet is rendered invisible by any Moon light, haze or high cloud. Having said that I did manage to glimpse it last night from my back garden in Maynooth so it can stand a little light pollution when it is very high up in the sky (it was nearly over head when I observed it last night). I can’t imagine this fascinating comet will still be visible one Moon cycle from now so make the most of the next few days to grab it before the Moon comes in to spoil the fun again, and probably for good this time!